The River Gipping Trust is preserving the historic heritage of the Stowmarket Navigation by restoring the structures that enabled navigation of the River Gipping from the centre of Stowmarket to the docks in Ipswich and caring for the flora and fauna of The Gipping Valley. The Trust is a registered charity and we rely on voluntary donations for everything we do. We are all volunteers so 100% of your money will go towards our work. Can you help us? Click on the buttons below to use Virgin moneygiving or Give as you Live to make your donation. 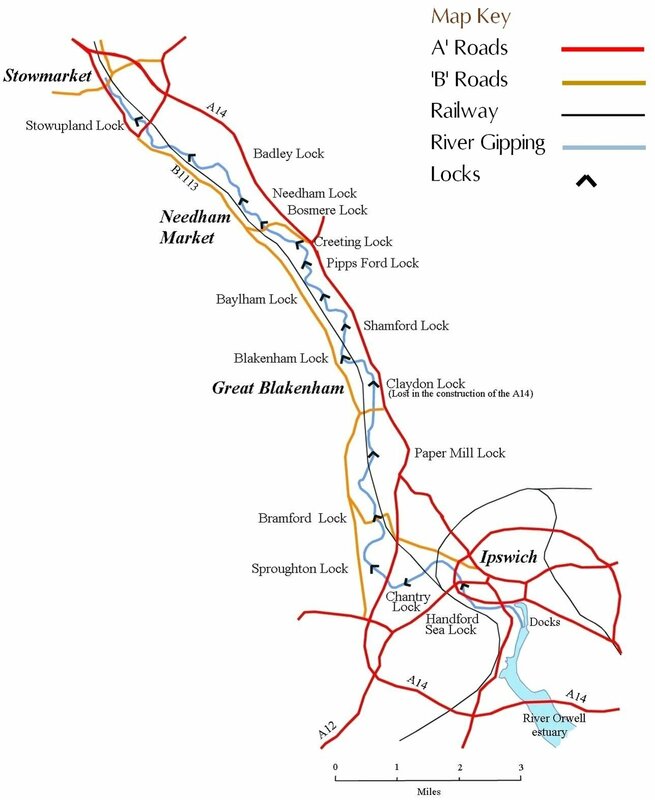 This map shows the route of the Stowmarket Navigation and the location of the 15 locks that were needed to overcome the height difference between Stowmarket and Ipswich (90 feet or 27.5 metres). Total length of the Navigation is 16 miles.